Join host, Robert Forto as he welcomes Bill Converse of Critter Zone to Dog Works Radio. Boy was he wrong! He plugged it up and placed it on the nightstand next to the bed and it started working right away! On this episode we speak to Bill about the product itself, the amazing science behind it and even offer a promo code to our listeners. Hint: You have to listen to the show to get the promo! Click on the link below to listen to the show. The CritterZone team has been in the air purification industry for more than 30 years. Their efforts led to a powerful solution, recreating natural air balances just like nature does. The technology of CritterZone provides indoor air with the power it needs to clean itself, just as the sun does for the outdoor air. William Converse is the president and inventor of the CritterZone Air Purifier. He launched Alpine Industries in the 1980s, and the company grew to revenues of $187 million in 1997. His sought-after technologies and experience led to radio interviews and speaking engagements at university-sponsored conferences. His expertise has been tapped to help tackle high-profile global air pollution issues, including helping reduce air pollution in tunnels in Sydney, Australia; in Kuwait after oil fields burned; and at the Pentagon after the 9-11 tragedies. Realizing the need for allergy and odor control for pet owners, Converse launched CritterZone in 2012. This new air purifier won the new product category at the 2012 SuperZoo National Show. 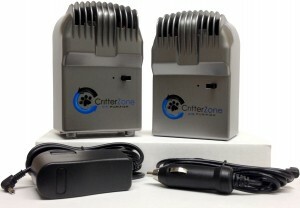 He recently donated several CritterZone air purifiers, along with car adapters, to a Florida K9 Unit to remove the odors and improve the air quality in their homes and patrol cars. The air purifiers are uniquely beneficial for K9 officers, because they don’t emit chemicals to cover up an odor. (That could interfere with the dogs’ highly trained senses of smell.) Instead, it removes the unwanted odor from the air. “We wanted to show our appreciation for the level of dedication and service the West Palm Beach K9 unit provides to residents,” Converse said of the donation.